The city is, increasingly, being defined by the invisible. Wireless hotspots, data flows and social networks are the arteries of the modern city, and a new project, ‘Invisible Cities’, tries to make sense of it all. 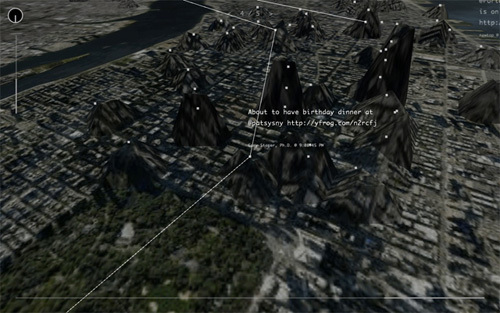 The brainchild of media artists Christian Marc Schmidt and Liangjie Xia, ‘Invisible Cities’ is an application that visualizes realtime and aggregate geo-tagged data from Twitter and Flickr. 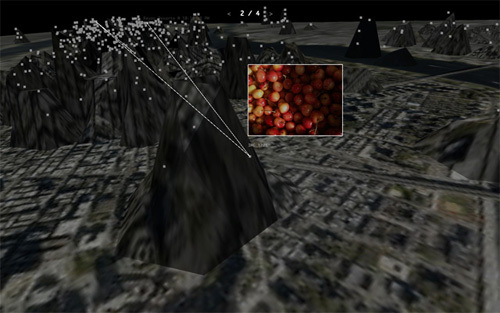 The online activity is then mapped onto their underlying terrain; and over time, the landscape warps, creating valleys and hills representing data density. 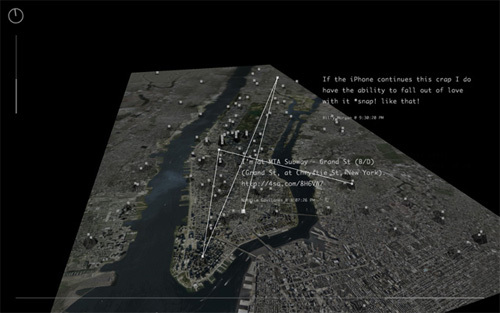 In short, ‘Invisible Cities’ maps the digital realm onto the physical one, creating what the artists describe as “a parallel experience to the physical urban environment”. It’s still a work-in-progress, but is still a really eye-popping way to visualize data. Who knows—Google might implement this in their Maps service one day.